India protest – Woof Woof !! I had been thinking of going to Jantar Mantar since last few days and when I came to know that the Supreme Court Bar Association was organising a march to ground zero or the new teerath sthan as some news channels had been claiming, I could not think of a better chance to go there. 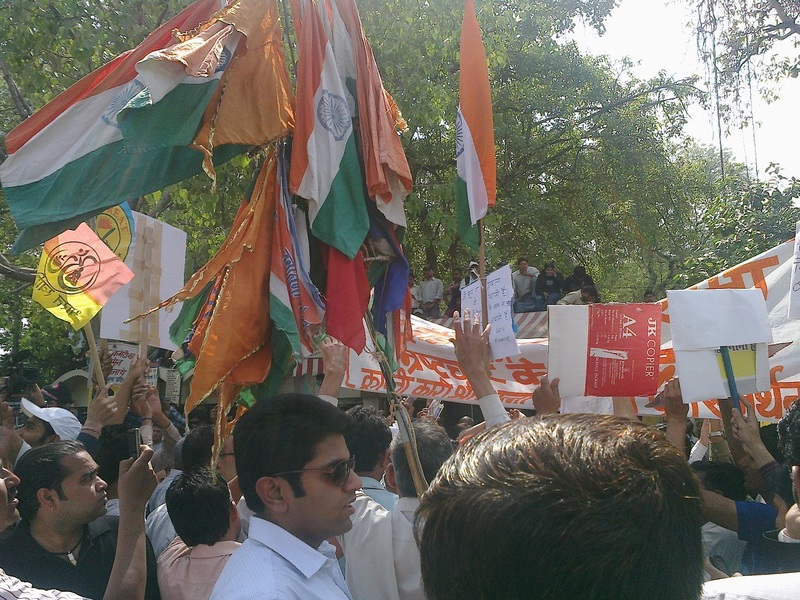 The march started with about 50+ lawyers at around 1:30 pm and we walked from the Supreme Court to Jantar Mantar. There were as many police officials as us to make sure we don’t go on a rampage out of excitement. The walk honestly was an experience with all the slogan screaming and traffic stopping but yet was not a good idea in the scorching heat. We reached the site after walking for about 40 mins and were welcomed by cameras and media people. The mood was upbeat and all we could hear was “Anna tum sangharsh karo, hum tumhare saath hain” (Anna keep protesting we are with you), the national flag was seen everywhere and patriotic music was being played in the background. Felt like the scene from all those movies I had grown up watching based on our freedom struggle. It gave an instant adrenaline rush and the feeling to kill all corrupt people in the country. Anna Hazare was sitting on a stage with Kiran Bedi, Tom Alter and a few more people. 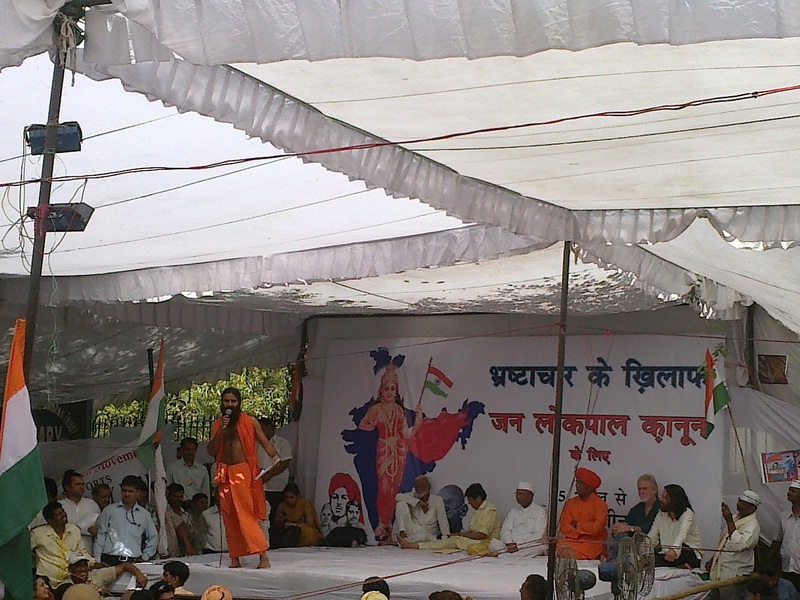 Baba Ramdev was on the mic talking against the corruption and the corrupt. He then started singing a patriotic song he had written. The crowd was cheering and chanting Vande Mataram. I was not very happy about Ramdev joining the revolution as he is politically inclined. But then someone said that people like him are needed as they are capable of attracting more people into the whole jing bang. After a while Ram Jethmalani, the president of the Supreme Court Bar Association, arrived at Jantar Mantar and after a massive ordeal made it to the stage where Ramdev welcomed him and he gave a small speech. I was walking back with him to his car when some media people caught him for a few questions. Whether he supported the Jan Lokpal Bill? He answered quickly, this whole agitation should be above the bill, one bill is not going to bring the change we all are looking for. A young man said Mr. Jethmalani that the youth are out here and revolting on which he candidly said that he wonders why does the youth need a ‘budha’ (old man) to revolt. This response made big sense and made me realise that we are not complete without our older generation. The 2 hours I spent at Jantar Mantar took me through a nostalgic time we all have experienced through all the books and movies on the Independence struggle even if we haven’t lived it. From Vande Mataram to Inqalab Zindabad, the Tiranga to the self less support of all the people there. Though I did feel a lot of them were there just because of the media attention, dressed up in the most unwanted fashion for the occasion. The environment there did make me believe that Indians are not just bothered about their own life but they still care for India. The kind of support the whole revolt has garnered is amazing. Although I still believe that this should not be a one point agitation and end with the demand of a law against corruption being fulfilled. The law is not going to help the cause as I said in my earlier post in some ways we all are corrupt. If we were not then this situation would had never seen the day. Next time let’s elect those who are not corrupt and let’s not be a victims of false promises. The upcoming state elections is the time to make the right decision and stand tall against corruption without any fear.